It’s that time again! WIAW party time! Let’s take a peek at some of my Spring Break eats! My days were filled with excellent breakfasts. A nice change from my cereal staples! Lunches and dinners were pretty typical and pretty boring. 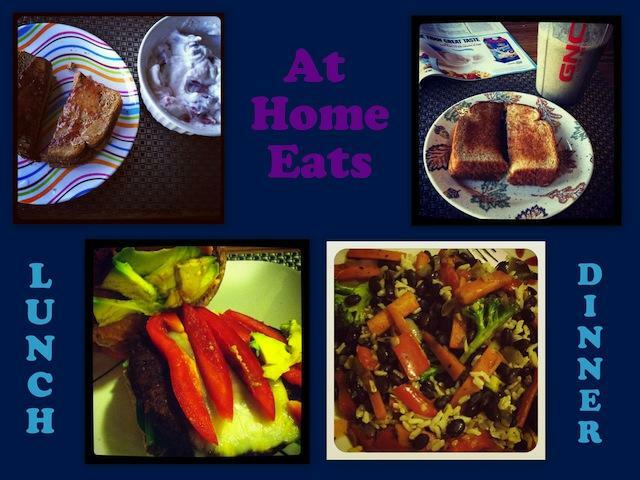 Lots of pb & j toast, smoothies, stir frys and black bean burgers. One night, however, we did go to Brews! It’s our favorite restaurant of all time. So. Freaking. Good! We used to eat there in college all the time and I’m fairly certain the hubby would eat there every single night if I let him! Fun fact- I get the quesadilla every.single.time we go there. No exceptions. I’m working really hard on making a healthy, individual sized brownie type thing. It’s not going well 🙂 I also thought I’d try baked quinoa instead of baked oatmeal. Turns out the quinoa on the top doesn’t actually absorb any water so it doesn’t cook and is crunchy and gross on the top! Better luck next time! I will gladly take everything in that hummus collage please! And the whole what pancakes, too! I was going to say how amazing that black-bean quesadilla looks before I even read that you order it every single time. I would do the same thing! Wow I love trying new grains for breakfast but it is a shame that the quinoa didn’t work out. I actually cannot get over the texture of quinoa so I don’t eat it but perhaps someday I’ll give it a try again since it is so good for you. you’re so lucky you got goat cheese pizza though- I’ve been loving goat cheese lately. So good with creamy and tangy mixed. I’ll take a delivery of that hummus platter to my doorstep, please. haha, so true! so does millet. Yet its so good. Right linz?! All of your breakfasts look yummy. I usually just eat the same thing, but your variety inspires me to change it up once and a while. Keep working on that baked quinoa idea. It sounds delish! I bet the single serving brownie will turn out great with a few tweaks…avocado and chocolate are a match made in heaven! Better luck next time with the brownies! Everything else looks great, esp the pizza and pb&js. I have been really wanting a good ol’ fashioned pbj! Your pizza and the black bean quesadilla both look excellent. I love black beans! Yummmm!!!!! That black bean quesadilla looks awesome! (I can see why you get it everything!) The Pure2Raw twins posted a single serving chocolate muffin yesterday! Maybe you could go off of that! I love being able to make pancakes on mornings when I have more time! Also sorry about your kitchen fails – they happen all the time to me too. 😛 But at least they almost always lead to an awesome recipe… eventually! Goat cheese pizza: YUM! And do I see basil on top?? Double win! The goat cheese pizza looks yummy! 3 more days until my Spring Break!! I had a cooking fail this week too – and, I was even following a recipe. Made me sad. That pizza looks amazing. And I’m on a big protein pancake kick right now. Yum! Hey, at least you tried with the quinoa right??? Goat cheese pizza?! YES PLEASE. I love goat cheese pizza. love. I don’t know how anyone could pass on a quesadilla! They are the BEST! 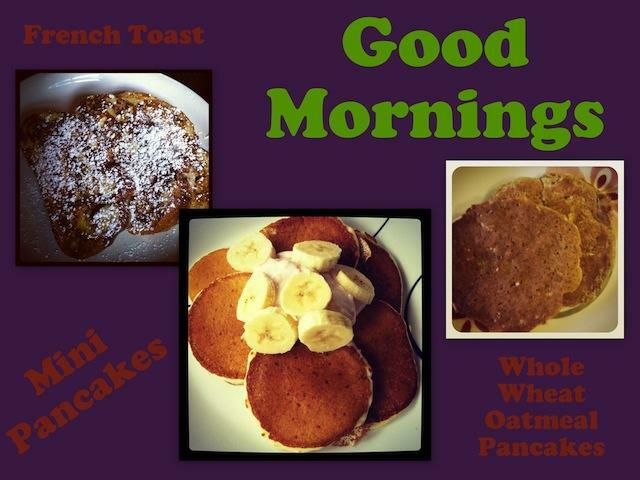 Ohh pancakes and french toast in the mornings on weekdays? That sounds fabulous!! 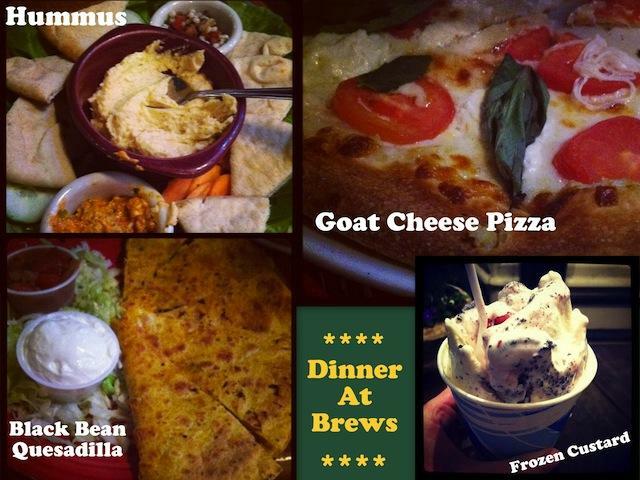 As does your trip to Brew… I don’t blame the husband for wanting to eat there every night! I’ve never had frozen custard but it sounds good! And sorry about the flops but it makes me feel better to know I’m not the only way to happen to! Hate when I have food fails! You get so excited and then…blah! I did that with this chocolate chip banana bread I made. I put way too many chocolate chips in and I could NOT get hte bread to bake through. In the end, I was like scooping it like batter and eating spoonfuls (bad idea). Had to throw it away eventually! I haven’t had french toast in years… that pic makes me want some! And I love your dessert experimenting, baking can be trickier than cooking with the unknown results. Can’t wait to hear the single serving brownie once perfected! What’s your black bean burger of choice? That frozen custard looks good. Custard is so satisfying!! Looks like a tasty week. Happy spring break! It’s always interesting to have some cooking/baking fails…at least you always learn something! The quinoa idea was a good one! That hummus platter looks amazing! 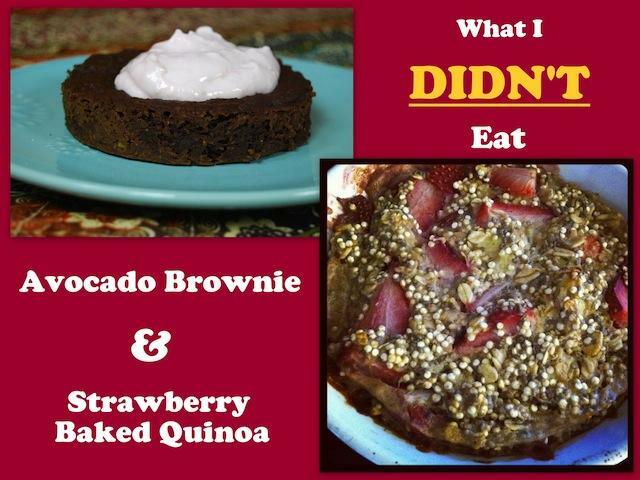 I make a quinoa and black bean bake and the top comes out crunchy like that, but its really good on a savory meal. Sometimes being at home with family is more exciting than excitig food…. Ya know what i mean?? A while back i made a baked oatmeal, but…….. I was almost out of oatmeal! I used just a little oatmeal and mostly leftover already cooked quinoa, it worked! The very top was a little crispy, but in a good way( esp w nut butter and maple syrup o top) so maybe your quinoa bake just need to start with cooked quinoa-?? “a healthy, individual sized brownie type thing.”? Sounds Amazing! Keep trying and pass on the recipe when you figure it out! I could go for some french toast right about now. Yum! French toast sounds so good! I went to brunch on Sunday and there was a dish on the menu that was french toast made from slices of the restaurants cinnamon rolls. Talk about decadent but I bet it would be delicious! lol. haha I love that you documented what you didn’t eat. I have also had some major kitchen fails this past week. I should do a post on all the things that went wrong! Is that a homemade goat cheese pizza?